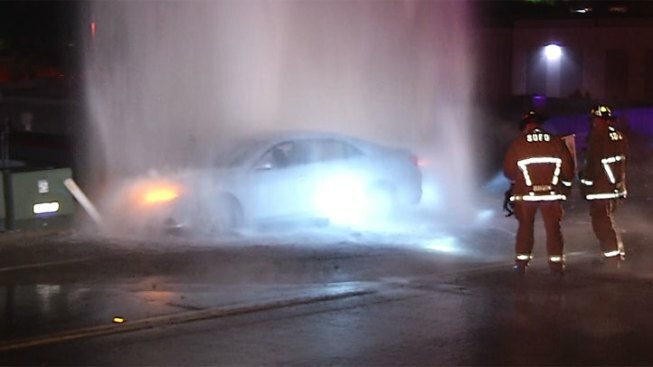 Emergency crews rescued a driver trapped by rushing water after his car crashed into a San Diego fire hydrant early Tuesday. San Diego Fire-Rescue responded to the crash at Euclid Avenue and Market Street in Chollas View around 12:40 a.m.
Crews discovered the man trapped inside his car with thousands of gallons of water pouring out of the broken hydrant. The geyser created by the crash shot approximately 80-feet into the air. Water was turned off 45 minutes after the crash but it took crews over and hour to get the driver out. San Diego police are investigating why the man slammed into the hydrant but say it doesn’t appear to be a case of driving under the influence.